The standard distance duathlon begins with a 10 km road run. This is two laps of our new 5k sprint distance duathlon course. 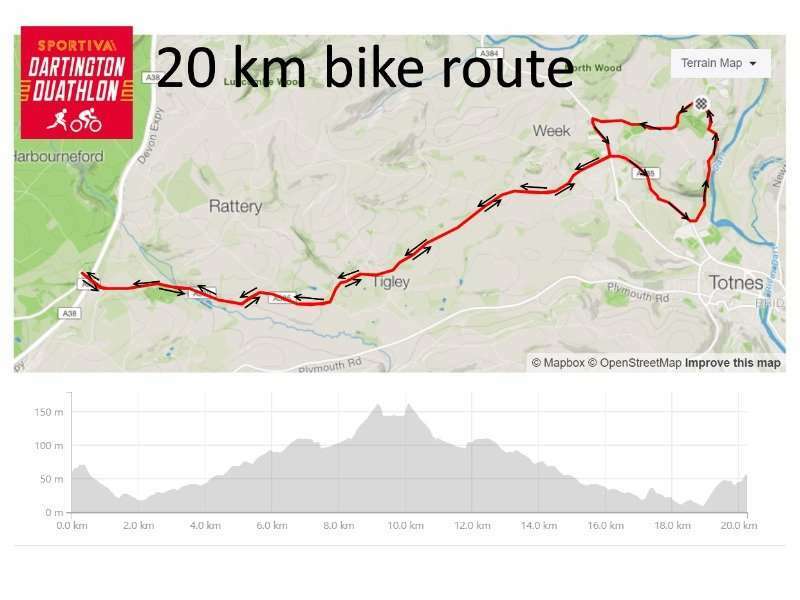 The bike leg is 40 km and is two laps of our 20km sprint distance bike course. 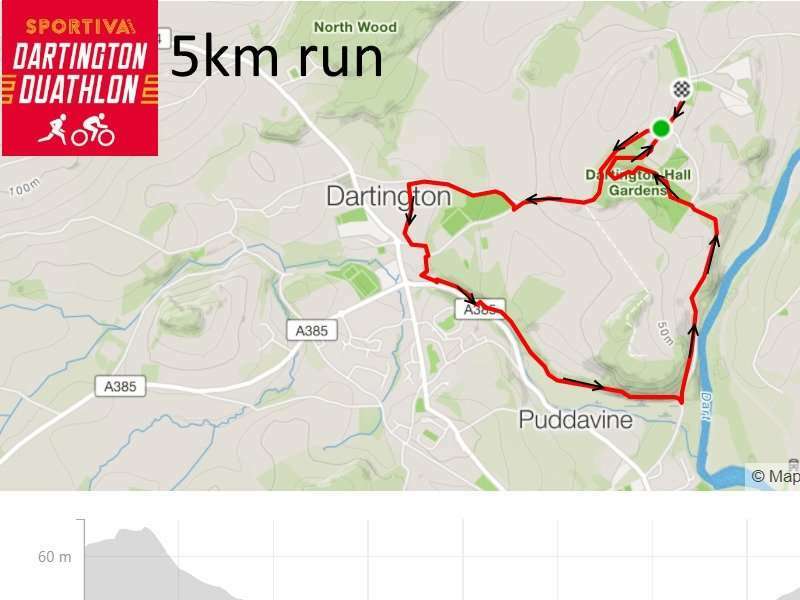 Both duathlons finish with 1 or 2 laps of our new 2.5K run course through Dartington Hall gardens. All duathlons are non-drafting & run in accordance with the British Triathlon Federation rules. Please see our RACE MANUAL for all the details about the event. Individual athletes compete under their respective age and gender category. Relay Teams compete against each other as an open category (mixed age & gender). Medals and prizes are awarded for winners within each of the categories. This is the map of the bike leg. It’s a rolling course that cunningly avoids any right turns (except at the two roundabouts) and has an extremely fast return section from Marley Head until you turn into Dartington lower drive. Starts on the upper drive downhill before turning left onto the river path. Returns to transition via the Dartington Hall gardens. This is the new Run 2 route. 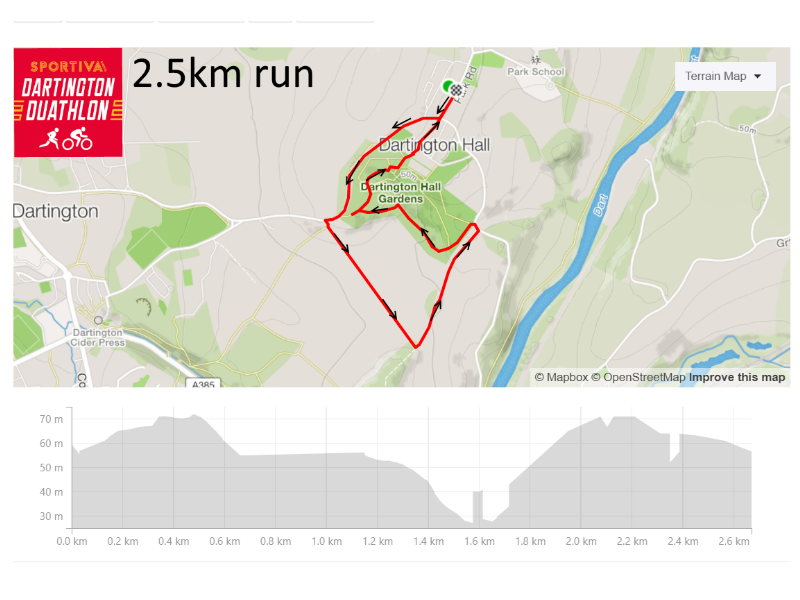 It’s flatter than our old Run 2 down to the river, has better surfaces (road shoes should be fine) and also takes you through Dartington Hall Gardens. 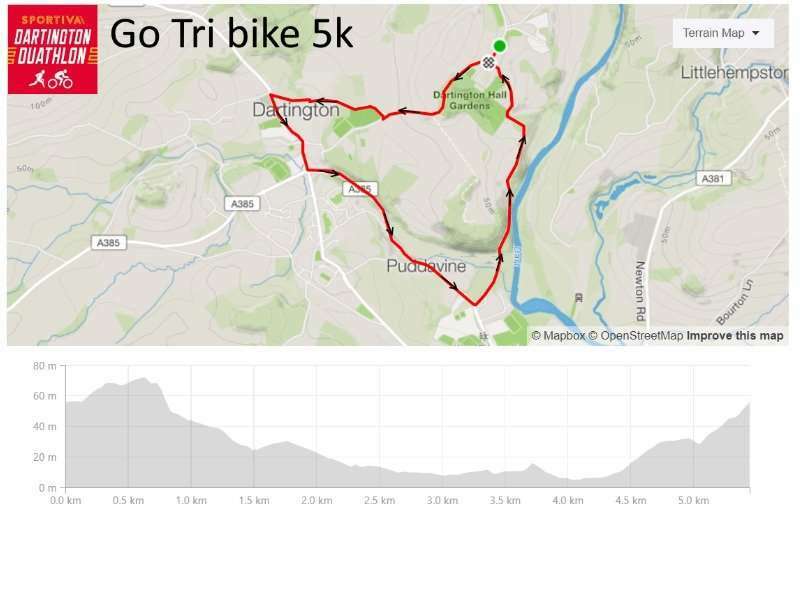 The bike route for the GO TRI is a 5K loop which you repeat twice. You start the same way as the other races then turn left straight down to Totnes (instead of right to Marley Head) then turn left and climb up the lower drive. Map of transition & location of car park for competitors and spectators. This race takes place on open public roads, the minimum age for participation is 15 years (Participants must be 15 years or older as of 31st December in the year of competition). Anyone under the age of 18 years must gain parental consent prior to registering online.